Thinking of getting a cat? Are you thinking of getting a cat? If so, have you considered adoption? Cat rescue centres are overflowing with cats that have ended up there for various reasons, usually through no fault of their own. 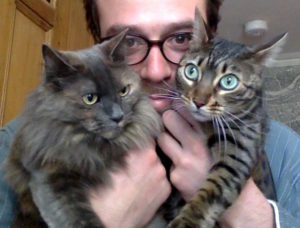 I have 2 rescue cats of my own (Charlie & Presley) who I adopted almost 10 years ago and I would suggest anyone looking for a new pet to check out their local pet rescue charity. They will be fully fit and of had a good MOT before they are allowed to be adopted so you know that you will be getting a healthy cat. You will be asked to make a donation to the animal charity to cover the costs involved with neutering and vaccinating them. ‘But I want a kitten’ I hear you cry! Do not fear, rescue centres have an influx of kittens due to the kitten season which is late spring, early summer so you would have your pick. I would always say 2 is better than 1, then can play and entertain each other, cuddle up together and just think of all of those photo opportunities you would get! Cuteness overload!!! What will my cat need? 1 food bowl, 1 water bowl – Remember to place them away from each other! A comfortable bed of their own – Cats need a safe place to sleep and whatever you buy should be soft and warm. Access to high spots – A place where they can view their surroundings. A simple cardboard box in a high place will do the trick. A scratching post – Scratching is a natural part of cat’s behaviour and helps to keep claws trim. A brush – Grooming is important, especially for long haired cats. Toys – Cat toys are great for playtime and are essential in keeping indoor cats occupied. For boredom busters you can make at home, visit www.cats.org.uk/enrichment. Cat carrier – While you might not need it often, a carrier is the safest way to transport your cat, making it essential for trips to the vet. Choose something well ventilated and sturdy. I've only worked with Paws Galore once, but I already know that I'm going to request their services for future vacations, especially Ricardo. He seems to truly have a connection with animals and enjoy their company, and he was extremely communicative while house sitting and looking after my small dog. When our flight home was canceled last-minute, he was happy to stay another night, which of course was a huge relief during a stressful situation. Not only that, but we came home to a cleaner house than when we left. I couldn't be happier with our experience with Paws Galore and am so thankful I found them! We’ve used Paws Galore several times over the past 18 months, and always receive exceptional service, often at very late notice. Specifically, Ricardo @ Paws Galore has done two 3-night overnight sits of for us in a short space of time and our car Minnie clearly loves him. A demanding kitty, she needs a lot of attention and Ricardo did a great job with her. It means the world to be able to go on holiday and not have to worry about Minnie, which we can as Ricardo gives daily updates with pics. He also left our flat in an immaculate condition, which was great to return home to. We will definitely ask for Ricardo next time we need a sitter! They can't do more to help. Very responsive and always with a personal touch - these guys care about what they do. Five stars recommendation! Informative. Affordable. Professional. Paws have pet sitting down to a science. Ricardo watched our three cats, and I have to say hiring Paws Galore was the best decision we've made for our cats in awhile. From start to finish, the company was responsive, informative and had a great plan for meeting and getting to know our cats. Ricardo was fantastic and gave us photo updates everyday. We hired him for the overnight package because two of our cats need medication twice a day, which isn't an easy task. Ricardo handled it like a champ. When we got home, the place was in perfect shape. The litter was done, trash was taken out, plants were watered and the house was even cleaned (sheets washed and dried as well). We will definitely be using Paws whenever we go on vacation. I’ve been using paws galore since the beginning of the year and the service has been brilliant. Kacey who deals with all the accounts is prompt in response and helpful. My dog walker Andrea is lovely and sends me update photos of my dog regularly which I find highly amusing and a little insight into what my dog gets up to when I’m not there. I find everything safe and reliable and completely trust them to walk my dog. Philippa walked our Pom puppy several times a week. Philippa was the first dog walker we've used, so naturally we were a bit nervous. However, there was no need as she was absolutely great with Buddy! Her flexible schedule allowed for us to change the days and weeks as needed. Loved the post-walk notes left for us! Reliable, professional pet sitting service that we use regularly for short and long bookings. We used to rely on our neighbors and friends, but one of our cats is quite elderly and we wanted someone who really understands cats to look after them. Our sitter was absolutely wonderful at looking after them and was in regular contact to let us know that all was well, and they were both perfectly content and happy when we got back. I cannot recommend them enough!! I've had two cat-sitters come from Paws Galore - too often close to the last minute at holidays. I've come back to find a contented cat that barely seemed to have noticed I was gone. They took excellent care of her - and sent pictures and updates - so that I was able to stop feeling guilty and just enjoy my holiday. Definitely recommended. We needed someone to watch our cat over the Christmas holidays and decided to try Paws Galore. We are incredibly happy with this service... our sitter, Pam, was great! She sent us updates/photos every day and it made our holiday so much more enjoyable knowing that our cat was in good hands. We came home to a very happy kitty and in our experience, it is clear that Paws Galore sitters go above and beyond their duties to try and make pets feel less lonely while their owners are away. We will definitely be using this service in the future again.